This guide covers the fundamentals of the Federal Direct Student Loan (Direct Loan) programs, including loan types, loan features, loan counseling requirements, and borrower eligibility. With this foundation, learners will then gain an understanding of the calculation of loan amounts, including frequency of borrowing, annual and aggregate loan amounts, application of the 150 percent limitation on borrowing Direct Subsidized Loans, and the rules for proration of annual loan limits. Understand how financial aid administrators may utilize professional judgment in the Direct Loan application process. Understand the role of the expected family contribution and estimated financial assistance in the calculation of loan amounts. Understand the rules for Direct Loan proration and when they are applied. Know how to prorate a student’s loan eligibility. Understand the required content of loan counseling and its purpose. 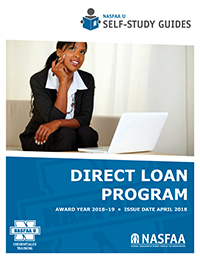 Identify and understand the major repayment features of Direct and FFEL loans. Know that repayment plan counseling tools and calculators are available to borrowers and where to find them.